Some of the finest musicians you'll see anywhere playing wonderful pieces of music. Those of you who regularly read my reviews will know that I'm a huge fan of the music created by Magenta, Chimpan A and Kompendium multi-instrumentalist, composer and producer Robert (Rob) Reed. 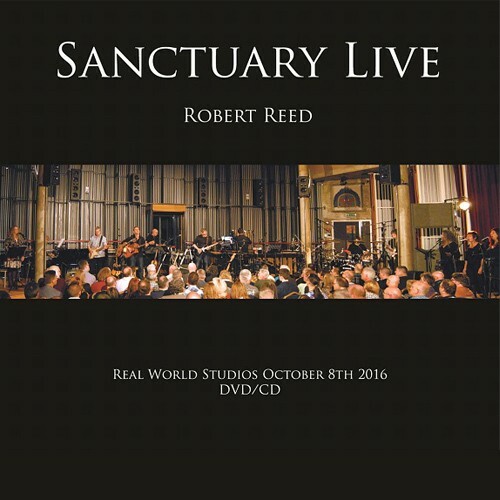 I've had the pleasure of talking with him about his Sanctuary project, and during an interview for this very publication, he mentioned that he was putting together a group of musicians to perform both 'Sanctuary I & II' at Peter Gabriel's Real World Studios near Bath, and here it finally is. For those who are interested, this isn't a full production stage show, instead, we get an intimate performance played in front of a small group fans who are devotees of Reed's musical escapades. This intimacy also has a magical quality to it, something that transfers into the music and band performances, and although visually there isn't much going on, musically we get the world. 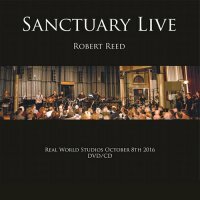 On the 'Sanctuary' albums, apart from a couple of instruments, Reed plays everything. However, for this recording, he's joined by world class musicians who help to bring his vision to fruition. These include Chris Fry and Martin Shellard (guitars), Dan Nelson (bass), Jonathan "Jiffy" Griffiths (drums) and Simon Brittlebank (percussion), while the keyboards are ably handled by Reed himself who is supported by Tim Lewis and Nigel Hopkins. If these superb musicians weren't enough to get excited about, there's also the added bonus of Fran Murphy, Lorraine King and Ffion Wilkins of the vocal group Synergy (who are joined by Magenta's own Christina Booth) to appreciate, while the lead vocals are handled by the awesome Angharad Brinn. The show opens with little fanfare as the band walk on stage, and due to Reed's self-deprecating nature, there is little banter with the crowd; however, this might have been lost in the editing. Instead, they launch into 'Sanctuary Part One' where we're treated to over twenty minutes of superbly played, written and arranged instrumental Folk/Prog Rock in the vein of early Mike Oldfield but with Reed's clever and subtle musical twists. The musical standout moments are many during this performance, but for me personally, it's the guitar interplay between Reed, Shellard and Fry that captivate the most. These three men play up a storm and on the visual evidence here are having a ball as they do so. As first part finishes, Robert Reed quietly introduces 'Part Two' of which only a small part of the suite is played. This is followed by the second half of the show and we get the full 'Sanctuary II Parts One & Two', and again, it's almost fifty minutes plus of spellbinding music that's played by musicians who really seem to care just how this music is performed. Rounding the concert off is a stunning rendition of 'Willow's Song' where Brinn gets the opportunity to show just what a stunning voice she has. This DVD/CD package might not have a big budget, or a stage show to take your breath away, but it does have some of the finest musicians you'll see anywhere playing wonderful pieces of music that were written by a man who has a passion for composing music that captivates and enthrals the listener/watcher from the first to the last note played.